See more objects with the tag women's clothing, personal adornment, accessories, grid, checkerboard, pleats. See more objects with the color antiquewhite rosybrown dimgrey darkslategrey or see all the colors for this object. This is a Apron. It is dated 17th century and we acquired it in 1952. 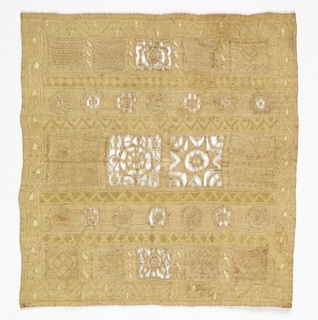 Its medium is linen and its technique is plain weave, embroidered with cutwork and needle lace fillings. It is a part of the Textiles department. 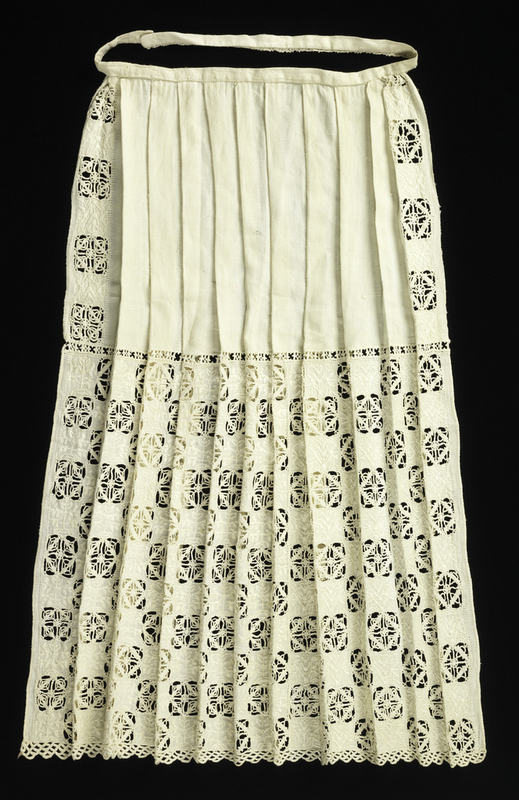 Charming linen aprons like this one from Italy were made by upper-class women in the sixteenth and seventeenth centuries. Never intended as utilitarian garments, these aprons instead served to showcase the skilled needlework that was expected of accomplished women of a certain social class. The publication and distribution of printed pattern books in the sixteenth century supported instruction in amateur needlework for the aristocratic and newly emerging merchant classes. These pattern books, with their dedications to noble women and virtuous work, were never intended for the professionals working in the guilds; their patterns were not considered innovative or especially difficult. This apron, made of a regular grid of white-on-white embroidery, squares of cutwork with needle lace fillings, and a simple needle lace border is a perfect example of the kind of work produced by a skilled, non-professional of the period.